Two FFF winners will be randomly chosen over the weekend, and each winner will receive a bottle of China Glaze Dripping Wet and a bottle of China Glaze Crystal Ball. Both of these are discontinued shades. Scroll down to yesterday's post for more photos of these polishes if you missed it. The rules are simple: You Must Be A Follower Of Some Sort. You Must Leave Your eMail Below In The Comments Section As Your Entry. All Entries Must Be Received By Midnight Tonight. That's all there is to it! Check the FFF Information Box over in the right side column, because every Monday I'll update it with the winner(s) and also with the prize for the next FF, which will be held December 11. Dripping wet has to be the most perfect vampy jelly and Leave it China Glaze to make it possible to add shimmer to a jelly! I have to say, i admire the slogan of you blog beauty for the body, hapinness for the soul! Love the China Glaze Dripping Wet, yummie laquer! Would like to participate in the freebie, thanks for the opportunity. Both are gorgeous! :) I follow on twitter & blogger. follower here, please enter me in, as the two shades are simply gorgeous! Gorgeous! That is one hot vampy! OOoh! Thank you for the opportunity! Great blog, great blog roll! Gorgeous colors! I'd love to be entered. thanks for doing these giveaways! :) now some people can try out these polishes. Crystal Ball is amazing, you are so generous with your giveaways! I was going to get Drastic (China Glaze burgundy creme) but I'll wait a bit just in case I get lucky. Love your blog! Stunning - why discontinue such yummy colours?! Ahh I love them both!! they look like gorgeous colors! thanks so much for the opportunity!!! they're gorgeous colors...! 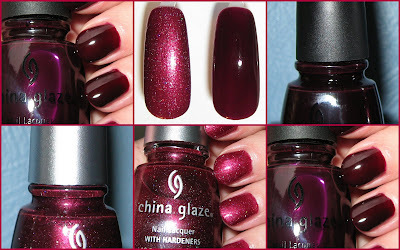 Wow would love to try this, havent try China Glaze before.. These are both beautiful. Ahhh for discontinued nail polish! Thanks for the chance! gorgeous colors! Happy Friday! Thanks for doing this giveaway. Oops, forgot to give my email. these are so beautiful :) and yes, i'm a follower! These are beautiful! I'm a follower. I love both of these and can see why they are your favorites! Thank you! These are beautiful and thanks for the swatches. I've been a lurker, but now a follower! Hi Mary, I hope have you a nice weekend! Whoa, they made some awesome shades back then. Please enter me in your giveaway. I am a Follower of your blog. Thank you Mary for all of these wonderful giveaways. These are two gorgeous polishes. I love Dripping Wet - I don't know how I missed seeing it somewhere before. It would be fantastic to win another contest of you. I'm totally one of your followers! Enter me please. What an awesome giveaway!!! *squeal* I'm def. a big follower! I follow your blog through an e-mail subscription. Thank you for these great contests! My email is swangeese at gmail dot com. love your blog! love china glaze! How sweet of you! Crystal Ball is gorgeous!! I saw these on your site yesterday and almost drooled. I'd love to try them myself. Ouch, I guess i missed it. Great idea anyway!